A few days ago, I was carrying a load of groceries home on my cargo bike. Ahead of me, a serious lycra-clad cyclist was cranking a nice-looking bike up the steady incline. Normally, I try to avoid passing hard-working cyclists on hills out of respect for their efforts. But on this occasion, the gap between us was shrinking quickly with the assistance of my electric motor. Cars were approaching us from behind which would catch up to me at about the same time I caught the cyclist. To avoid a situation which might force me out of the bike lane, I quickened my pace and passed the cyclist at more than twice his speed. 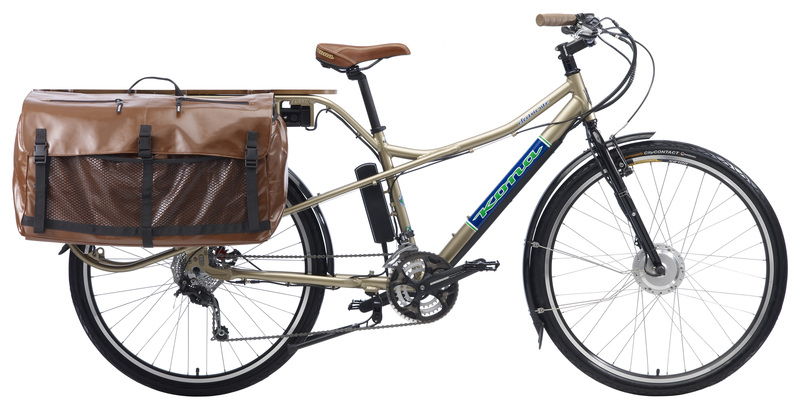 Many biking purists scoff at electric bikes, and I can understand why. If my hard-earned athletic achievements were nullified by someone “cheating” with an electric motor, I wouldn’t be thrilled. On the other hand, the boundaries of “pure” biking aren’t black and white. For example, some dedicated cyclists ride fixed-gear bikes (“fixies”) without extra gears and derailleurs. 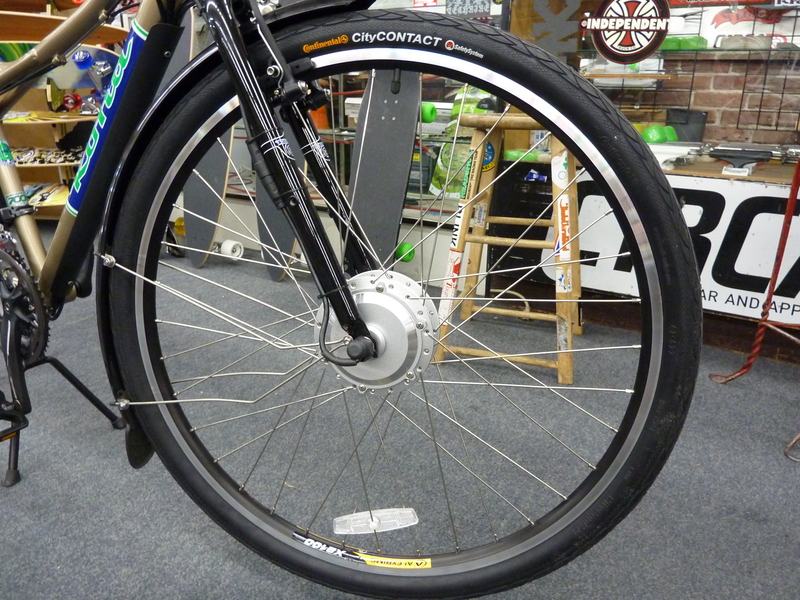 Extreme purists even remove the freewheel for coasting as well as the brakes (although that’s illegal in some cities). One could reasonably say that purity ends where non-muscular assistance begins. But that’s where practicality begins as well. The fact is, I wouldn’t have been hauling those groceries up that hill if it hadn’t been for my electric motor. If bicycle-based transportation is going to grow significantly in the U.S., we must broaden the concept of cycling to include motor assistance. We must enable Americans of average fitness to carry stuff uphill on two wheels. This vision was validated by bike giant Trek when they announced their Transport+ electric cargo bike (see here for further thoughts on that bike). This month, another big company joins the parade: Shimano is introducing its “STEPS” system that includes a 250W front hub motor activated by a torque sensor (like the Kona Electric Ute), an electrically-shifted hub transmission, regenerative braking, and battery-powered front and back lights. 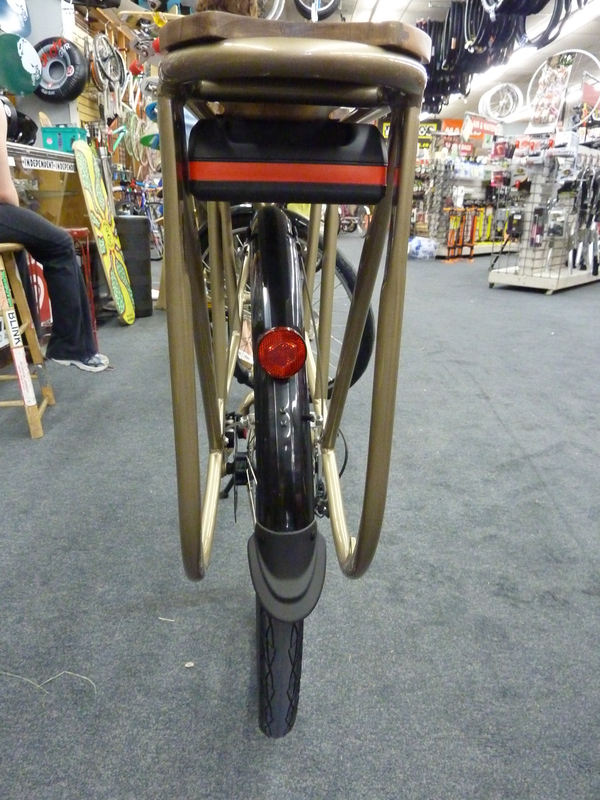 Although a 250W motor is, in my opinion, a little skimpy for cargo bikes, more powerful motors and batteries will come. What’s important right now is the products and competition brewing in the electric bike market. I can imagine a day when unpowered bikes will be considered like fixies are today: cool, but for a very special segment of the population. Will the march of progress stop with the coming generation of electric bikes? Of course not. Will bikes play a bigger role in future transportation, or will they also make way for something like a lightweight, enclosed personal car with no pedaling required? I hope that’s not the outcome, but our individual choices will determine that. 70 pounds — the unloaded weight of my Hammer Truck, battery, motor, bags, lights, etc. That’s actually somewhat heavier than I expected. And that doesn’t include the canvas shopping bags, rain cover, bike lock, water bottle, bungee cords, and other things I keep in the side bags for easy access. No wonder I feel a little weak when I turn off the motor (only occasionally) and try pedaling up our hill. 30 pounds — the weight of my non-powered bicycle for comparison. 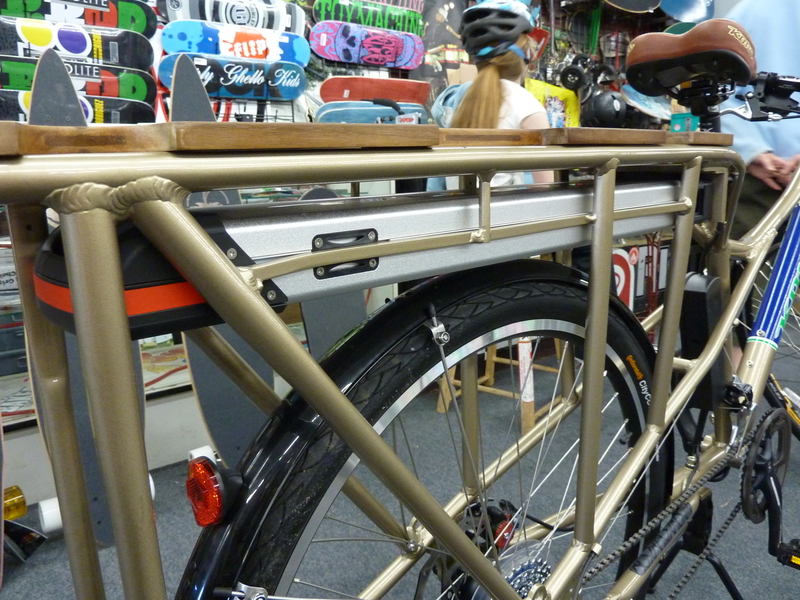 But I almost never ride it if the cargo bike is available. 10% grade — the incline of the road in front of our house. 18% grade — the incline on the steepest section of road on our way to school every morning. It lasts for about 100 yards. When I’m hauling a 70-pound kid and 20 pounds of books and instruments up that part of the hill, the motor and the human are both close to their limits. This is when you begin to appreciate the miracle of cars. Just press that accelerator a bit more towards the floor, and 10 times the mass of my load leaps up the hill at 5 times the speed. But that challenge only lasts for 100 yards, and most people don’t have 18% inclines in their daily routes. The 10% grade feels more reasonable, as you can see in the first part of my Electric Cargo Bike video (http://mycargobike.net/2010/05/06/cargo-bike-video), where I haul my son and his stuff around the corner and up the hill. 7 months — the length of time I’ve been riding my bike down that hill, often with two kids as passengers, without any brake replacements or adjustments. 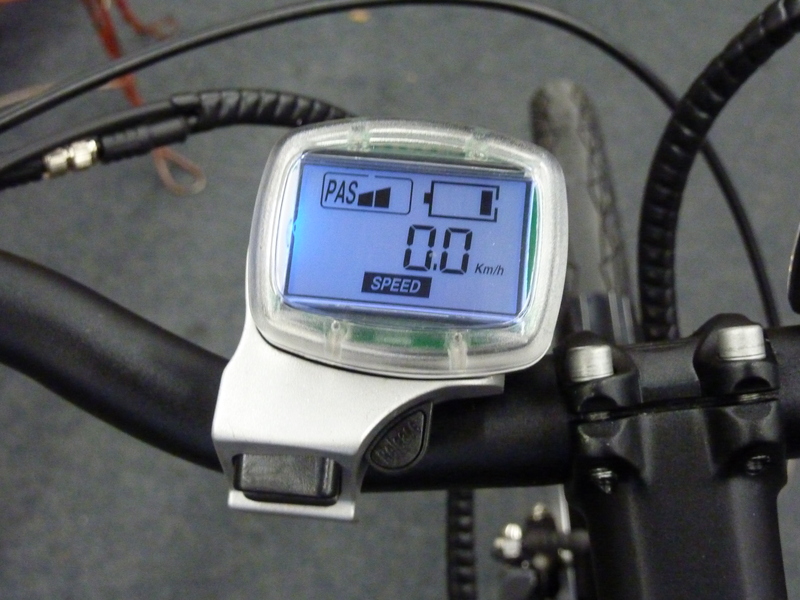 I think that is the best aspect of the BionX regenerative braking system. I’m just beginning to think that an adjustment might be necessary in the next month or two. My wife wore the brake pads on her traditional bike down to the metal in that same span of time. 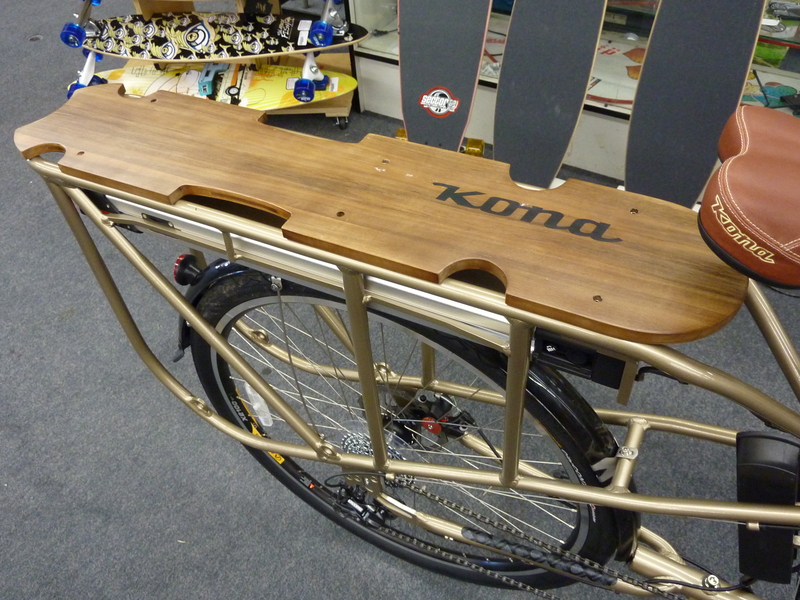 Good news: I’ve found an owner as well as two local bike shops who have the Kona Electric Ute. 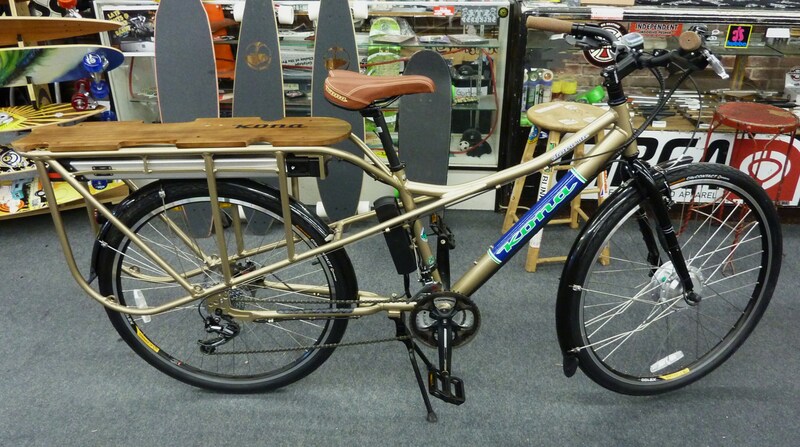 I hope to take it for a test drive this weekend at a local sustainability faire!